Memory foam pillows are composed of viscoelastic polyurethane foam, a type of foam which conforms responds slowly to the pressure exerted by a head or neck. The memory foam material also becomes more pliable when exposed to body heat, so the pillow will become softer as your head heats it. Able to mold to your curves yet provide support to your head and neck, sleeping on a memory foam pillow can provide several important benefits over other pillow types. A key factor in pillow selection is head and neck support. Memory foam pillows were designed with support in mind since they are initially firm and can be formed into any shape. 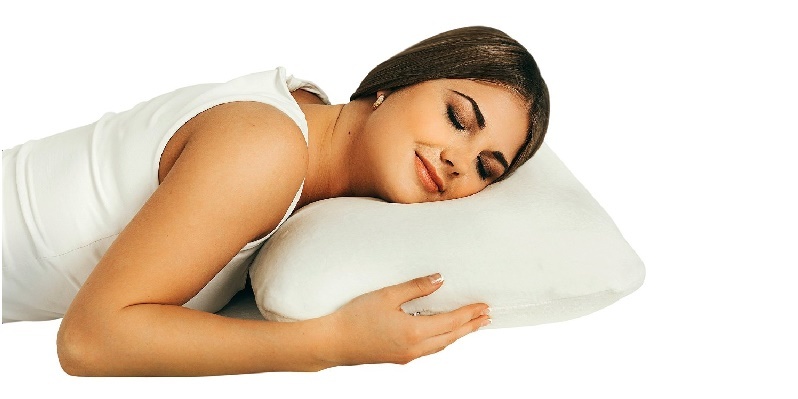 A memory form pillow that has a concave shape will provide additional support to the delicate vertebrae of the neck through the night while at the same time cradling the head. This responsive shape would be nearly impossible with a traditional stuffed pillow. Breathability is another factor that sets memory foam apart. This space-age material is able to take any shape and even retain most of its strength when filled with holes to maximize breathability. Some memory foam pillow designs contained ventilation holes through the center of the pillow that prevent the head from overheating during the night while maintaining support and comfort. A traditional pillow will simple compress and act as a powerful insulator, trapping heat in. That’s why models like the Perfect Cloud Double Airflow Memory Foam Pillow are good option for a new bed pillow. Although there are other treatments for snoring, a memory foam pillow is an easy fix that has been shown to significantly reduce snoring by maintaining a proper position for the airways. Unlike other pillows that will either compress too much or not enough, putting the neck at an uncomfortable angle, the unique texture and shape of the memory foam pillow will ensure a proper position throughout the night and prevent snoring. Memory foam pillows provide a cooling sensation of weightlessness that helps its users fall asleep faster, but it also responds to body heat by softening. Combined with its cooling properties, this allows the pillow the perfect balance of firm support and soft comfort. Molded into unique shapes, the memory foam pillow can do what is impossible for an amorphous traditional pillow. Memory foam can be purchased in a variety of firmness levels, depending on the preference of the sleeper. By adjusting the chemical composition and density of the viscoelastic polyurethane foam, the pillow can be slower or quicker to react to the pressure of your head. So just as mattresses are rated for hardness, so can memory foam pillows. Finally, a memory foam pillow is resistant to bed beg infestations and they are most often treated with anti-microbial chemicals that help reduce the growth of bacteria. A traditional stuffed pillow can act as an incubator for infection and a home for tiny pests that emerge at night in search of blood. With memory foam, they are unable to take of up residence and bacterial growth is inhibited. Still, it is recommended that you replace your memory foam pillows every six months to a year to ensure it stays in peak condition. Paired with a smooth pillowcase, satin perhaps, it is difficult to beat a memory foam pillow. It is more supportive, breathes better, conforms to the head and neck naturally and can prevent both infestations and infections. Eye Masks for Sleeping – Finally Get Some Rest!